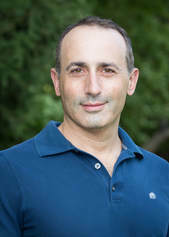 Adam Oberman joined McGill University Fall 2012. He is also the director of the Applied Mathematics Laboratory at the CRM. Previous positions: faculty at Simon Fraser University from 2004 to 2012. He was postdoc at the University of Texas, at Austin from 2001-2004. He spent a Simons Fellowship at UCLA in 2017 and a sabbatical year in 2010-11. He obtained his PhD at the University of Chicago in 2001, under the supervision of Peter Constantin.